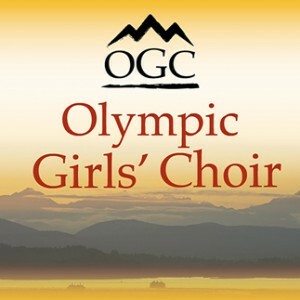 In September 2018 the Olympic Girls’ Choir welcomed newly-appointed Artistic Director Angie Godfrey and Girls’ Choir Accompanist Laetitia Lehman-Pearsall. Serving girls ages 7 through high school residing on Bainbridge Island and in the Kitsap area, the girls’ choir provides a transformative experience through high-quality, diverse choral music education which emphasizes teamwork, encourages self-discipline, and fosters a deep commitment to artistic excellence. Along with music theory, sight reading, vocal technique and ensemble singing, the girls learn to be musicians in the context of a choir community. Repertoire is varied, ranging from traditional choral literature to current favorites, with each session culminating in a concert. As well, singers perform in the adult Chorale Family Holiday Concert, and in various other venues on the Island. The choir is comprised of three ensembles, Encora (non-auditioned, Meet-the-Director appointment required), for girls in Grades 2 and 3, Cantabile (auditioned) for girls in Grades 4 – 6, and the Chamber Choir (auditioned) for ages 12 and up. Auditions and Meet-the-Director appointments for the Spring 2019 session will be held after school at Montessori Country School on Tuesday, January 8. Please email OlympicGirlsChoir@gmail.com for more information about scheduling an audition.